Our story concerns hapless Hiccup, a young clumsy Viking desperate to prove his worth to his father Stoick (chieftain of the tribe, voiced by Gerard Butler) and his love, Astrid. When he manages to capture his first dragon, a deadly Night Fury, nobody will believe him as he is unable to kill it. Instead, he befriends it and ultimately proves his worth to the Viking tribe in a predictable, yet thrilling, way. Sure, it's a children's film, but like the best it has universal appeal. It has loveable characters, both human and reptilian, and though it's not a complete comedy, it has its fair share of laugh-out-loud moments. Most of all, it's cheerful, upbeat and highly enjoyable, without being slushy. Special mention must be given to the visuals, though I am a sucker for fantastical Viking/Dragon style. This is a beautiful film, especially on Blu-ray. 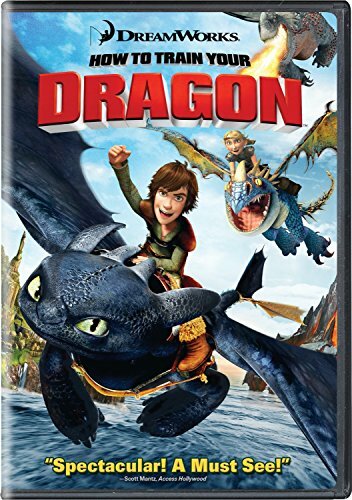 The environments look incredibly realistic; the dragon characters are full of expression; and every detail of the scale, hair and fur textures can be seen. Stunning. This really does have everything: a heartwarming narrative, epic musical score, excellent visuals and charm. It's guaranteed to put a smile on your face.